My 3 year old daughter has been doing this thing lately. She likes to repeat “Mama” over and over again, even if I acknowledge that I hear her. I really think she just likes to hear herself say it. When I say, “What?” to her, she keeps it up. Sometimes she throws in a, “But, Mama.” She says it fast, too, and on repeat. I remember a commercial that used to air on TBS. I think it was for Family Guy. I never watched the show, but I can remember this commercial. The little baby, the one with the English accent, is trying to get the attention of his resting mother. He says, “Mama, Mama, Mom, Mama, Mama, Mom…” and so on until she finally yells, “What?!? !” Then all he has to say, is, “Hi.” That’s what this is like to me. Cute, but annoying. And why is it that kids will keep asking the same thing over and over? It’s as if they think we don’t hear them until they say it 20 times. Even after you answer, they sometimes keep asking. As if the asking again will change your mind. You know what, sometimes the repeated asking does change my mind. Sometimes, it’s easier to give in than to keep saying no. I find that I often say “No” too quickly. Then, as they keep asking, I think, “Well, I guess that would be ok.” And I change my mind. I give in. I know this is not great parenting. I am trying to weigh my response before I give it. But that’s not what this is all about. It’s about the asking. Jesus taught about a similar situation. He paints the picture in Luke chapter 11. He is teaching his disciples about prayer by telling them a story about a couple of friends. The first friend approaches the other friend’s house late at night and asks for some bread to feed a surprise visitor. The friend first says, “No. We are all in bed for the night!” But the first friend keeps asking and asking. He probably caused quite a ruckus. Finally, Jesus said the second friend got up to give his friend what he wanted. He did this not because they were such great friends. No, he did this because of the “shameless persistence” of his friend (v. 8). In other words, he was annoyed and knew the man would not give up. Then Jesus brings it full circle for the disciples and for us. “And so I tell you, keep on asking, and you will receive what you ask for. Keep on seeking, and you will find. Keep on knocking, and the door will be opened to you. For everyone who asks, receives. Everyone who seeks, finds. And to everyone who knocks, the door will be opened (Luke 11:9-10). Now, let me just say that this verse does not guarantee that we will receive everything we pray for. Nope, no matter what we pray, God is still Sovereign. He still reigns over all the earth. I sometimes wish it could be different. But God knows the future, so He chooses to withhold some answers to prayer because He has a different plan. That’s hard. For someone like me who likes to be in charge, it is often hard to not have my prayers answered when I want them to be answered. But we can be encouraged from this scripture. 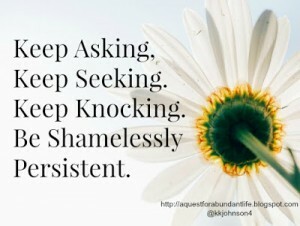 If we keep on asking, we will receive. If we keep on seeking, we will find. If we keep on knocking, the door will eventually be opened. way, in a way that is in line with His plan. When we pray those prayers, it is only a matter of God’s timing. They will be answered if they are part of His will. We can believe that and claim that. Be like my daughter. Keep calling on His name. He hears. He doesn’t get annoyed. He answers in His own time. He wants to give you good gifts. Be shamelessly persistent.